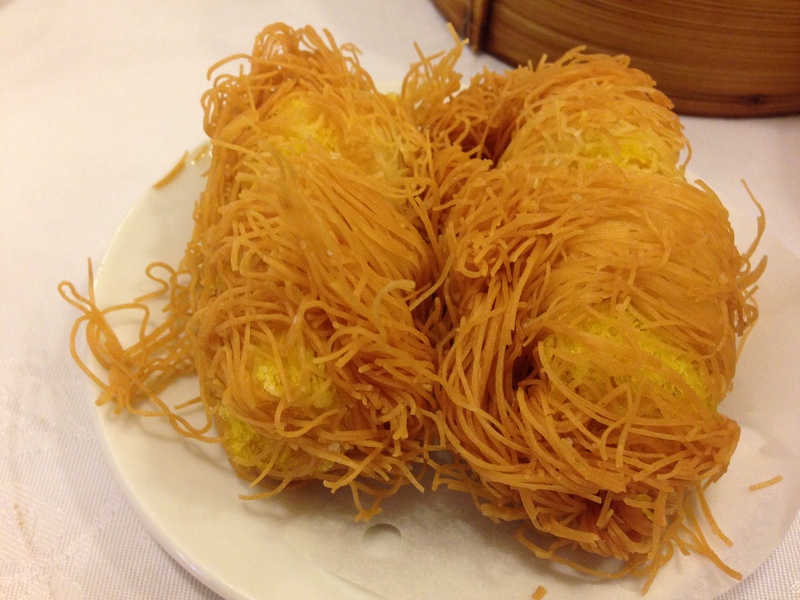 It should be no secret that Hong Kong has some of the greatest dim sum in the world. There are both pronounced and subtle differences to what I’ve experienced across Australia in Melbourne, Perth and Sydney, but the only important comparison is that Hong Kong contains the masters of this beautiful and iconic cuisine. 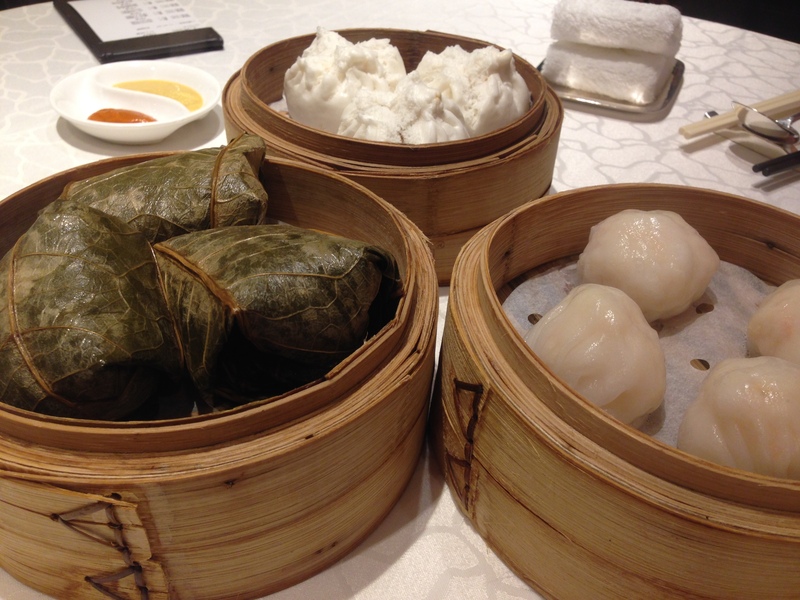 Within Hong Kong you find that at the best dim sum restaurants, there is a formula that needs to be followed in a precise fashion given the weight of numbers wanting their fill. That formula has nothing to do with facades, for it is the food that rules whether or not success will be sustained. 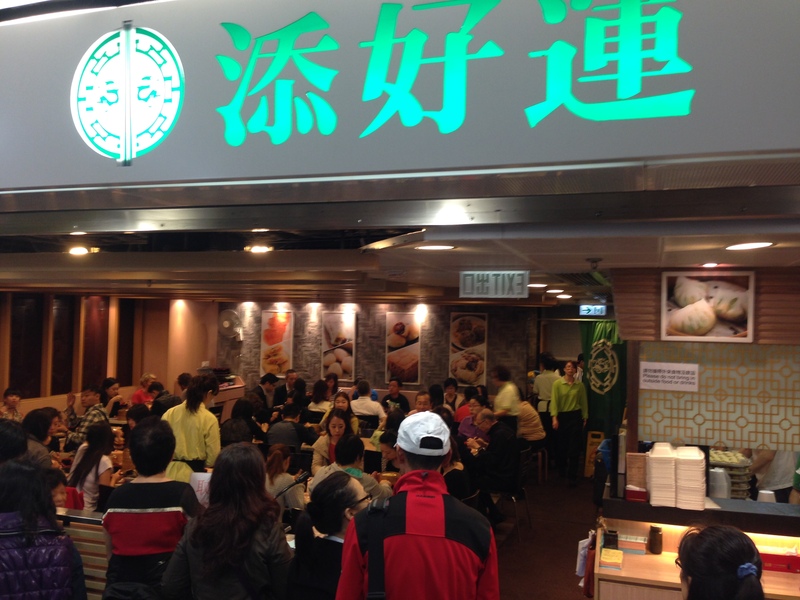 The branch of Tim Ho Wan in Central is a great example. Reams of small pieces of paper with brief descriptions of the dim sum available are being filled out by tens of hungry diners waiting for their names to be called out. All in the bottom of Hong Kong Station in as plain a shopping space as you are ever likely to find. Compare that to the opulence of Fook Lam Moon and its decadent room, often full of celebrities; or Luk Yu Tea House and its almost unflappable authenticity. These are restaurants with tradition abounding, greatness being shown in the meticulous dim sum, and floorstaff with absolutely no arrogance doing their job with so little fuss it almost epitomises quiet confidence. Back to Tim Ho Wan and the procedure. Put your name down, get your piece of paper, fill it out, provide it once your name is called, sit down, eat, sip, leave. This is no space to be quietly contemplating anything. There are so many people outside waiting with their pencils and pieces of paper, with looks of consternation, that you would think we are at the races. My tip here, which no doubt goes without saying, is get here as early as possible and be prepared to wait. We arrived about 11.45am and were seated shortly after midday so all was good. Like all three places I’m describing in this blog, the dim sum is delivered fresh based on your order. At THW we had marked down the several dishes, savoury and sweet, that we wanted, so we knew the exact cost (plus service) for our meal. Dishes then arrive once they are ready in no particular order with sweets accompanying savouries. 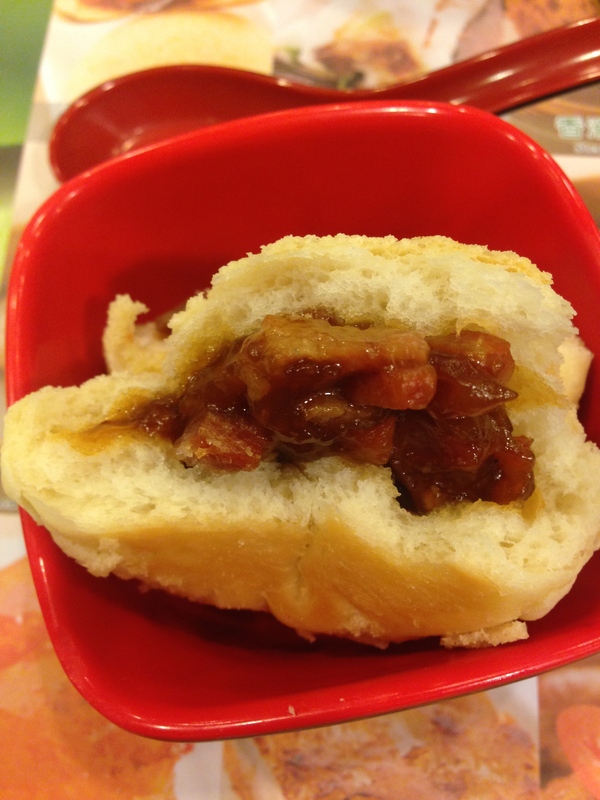 The apparent go-to dish is the baked pork buns. The dough has a touch of sweetness that is not overpowering but combines well with the gorgeous pork filling. There is a nice texture there from the baking, rather than steaming. Once THW is in Melbourne in 2015 I’ll be going out of my way to have several tries of the buns again because they are revered for a reason. Almost every dish was excellent including the har gow (steamed prawn dumplings) and the black sticky rice cream. Though the main standouts other than the buns included the “tonic medlar and petal cake” which is definitely a classic dish often differently described. 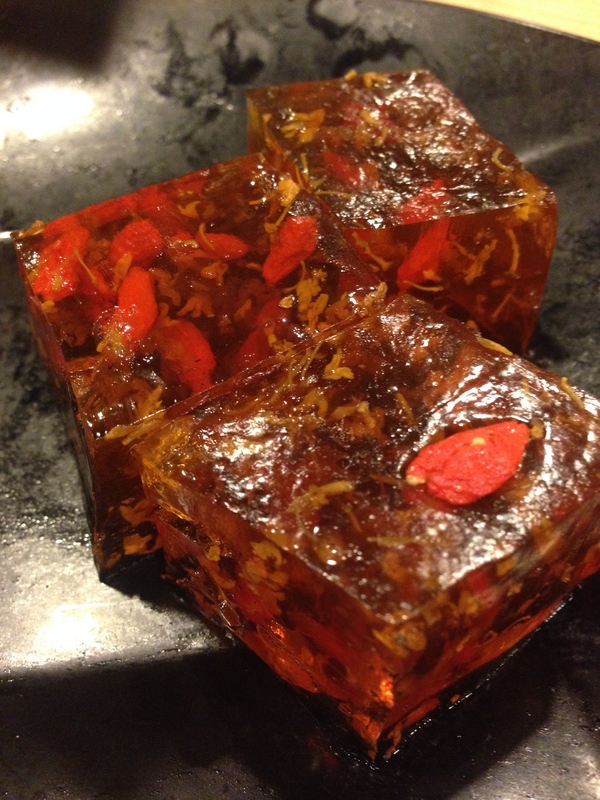 I believe it is made with chrysanthemum tea and petals but I’m really not sure. In the end it is a delicious, slightly sweet, textural jelly that is the perfect cleanser. The other standout was the glutinous rice or lo mai gai. This classic dish, wrapped in lotus leaves, contains chicken, Chinese sausage (tastes like blood sausage here), mushrooms and several other base ingredients. The perfume from the steamed lotus leaf provides an attractive introduction to what is a dense, decadent, and rich package of rice and meat. The only let down in the THW script was the seasonal vegetable being steamed iceberg lettuce. In any cuisine steamed iceberg lettuce is disappointing. 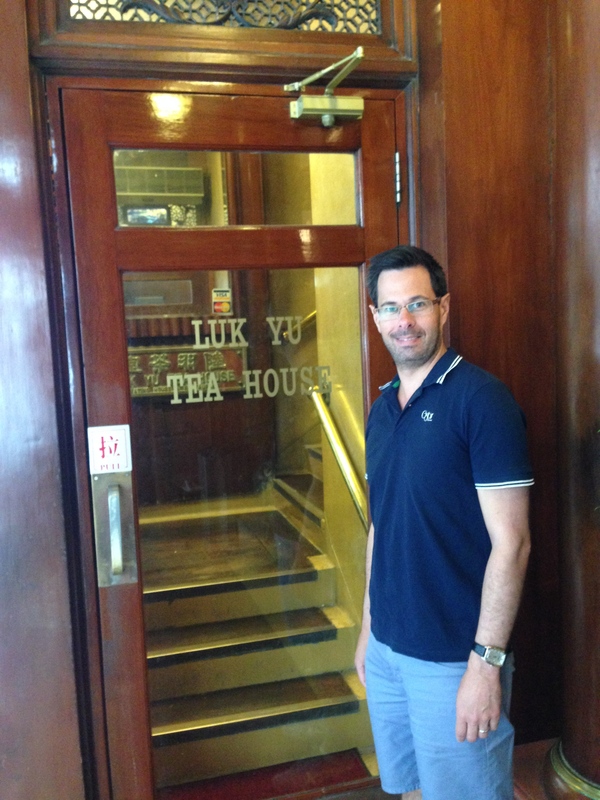 It was not my first time to Luk Yu Tea House and it won’t be my last. I feel I know what to do here – beat the nearby workers in Central to the table before their lunch hour. While it feels a little empty on this Monday late morning, by 1pm the restaurant is filling up with large bookings being seated. Inside, the restaurant has this feel like it was put together overnight, several decades ago! That is not to say it is without charm, in fact it, and the staff, have charm in spades. We tried the steamed pork buns (or char siu bao), the har gow, spring rolls with shredded chicken, and shredded barbecued duck meat & mushroom dumplings. All arrived freshly prepared and mighty quick! There is exquisite technique shown by the dim sum chefs in both the presentation and taste of each dish. The fact the technique needs to be duplicated with monotonous regularity adds, rather than detracts, from the greatness. 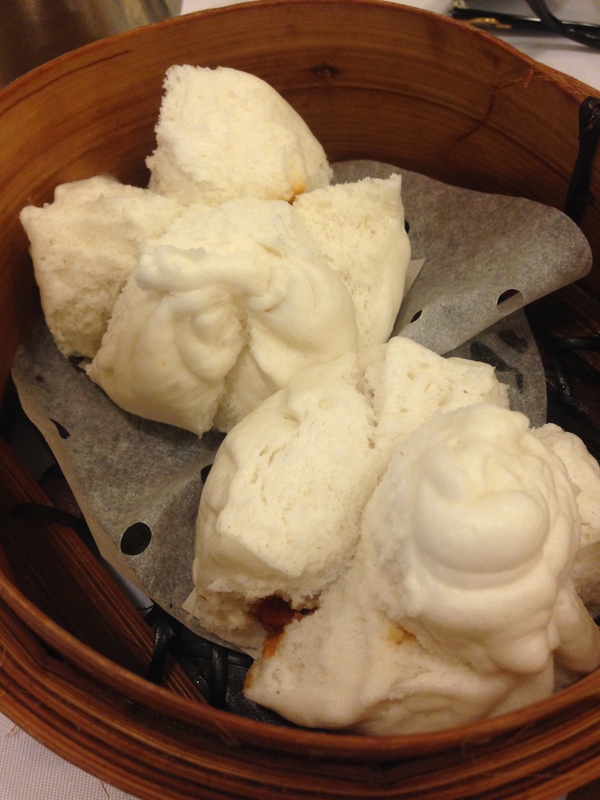 Here the char siu bao is classically fluffy, with a nice and hot filling of juicy barbecue pork. The har gow are almost overflowing with succulent prawns in a glutinous wrapper that tastes as pretty as it looks. There is an ease about Luk Yu. We finish with egg tarts and oven baked peach cakes. The egg tarts have flaky pastry that catches the sweet egg filling. I try not ordering them all the time because I can’t stop at one. The “cakes” are oddly described, but taste incredible. A combination of fresh peach and custard contained in the wicker basket like pastry are also impossible to not finish! On the last day of the trip we venture to Fook Lam Moon and I have made a mistake in wearing shorts as this dim sum temple is anything but casual. Again there is no concern from the staff and we are made to feel welcome. 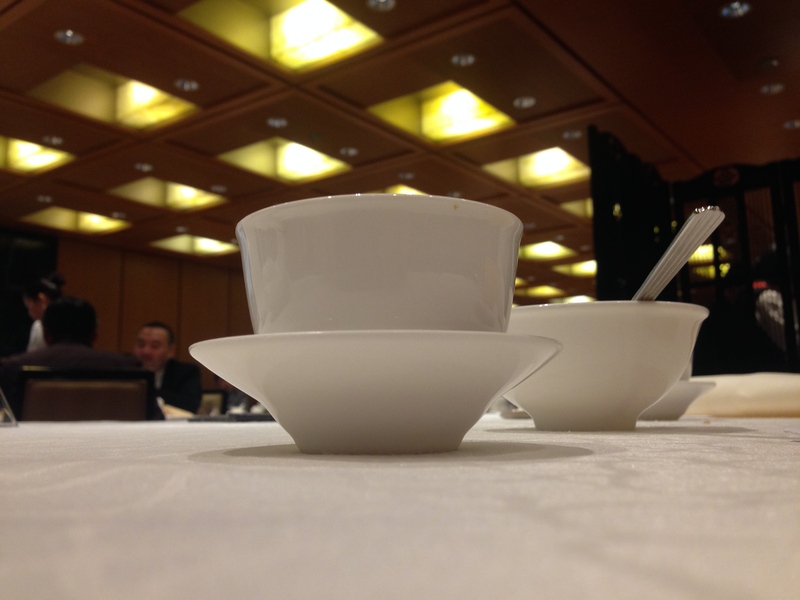 It does go to show that decor can be the final ingredient, even in HK, for a Michelin star. Everything, and I do mean everything, we try is top quality. This is probably my favourite dim sum experience for the trip. The prawn spring rolls are nothing short of astonishing. 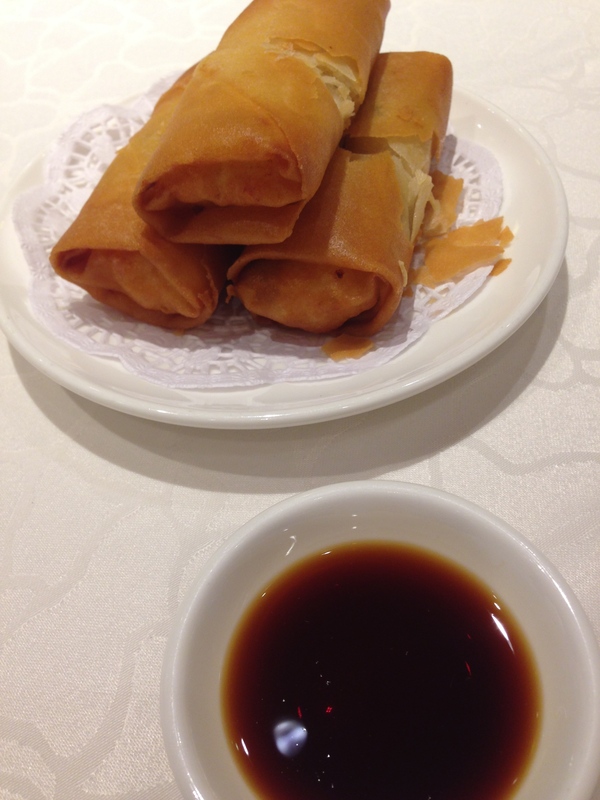 Spring rolls are both enticing with their fried crunchy exterior, and often boring by their similarity and familiarity. These are perfect because they have that exterior, but inside the fresh juicy prawns are incredibly flavoursome. I wish I could have some more! 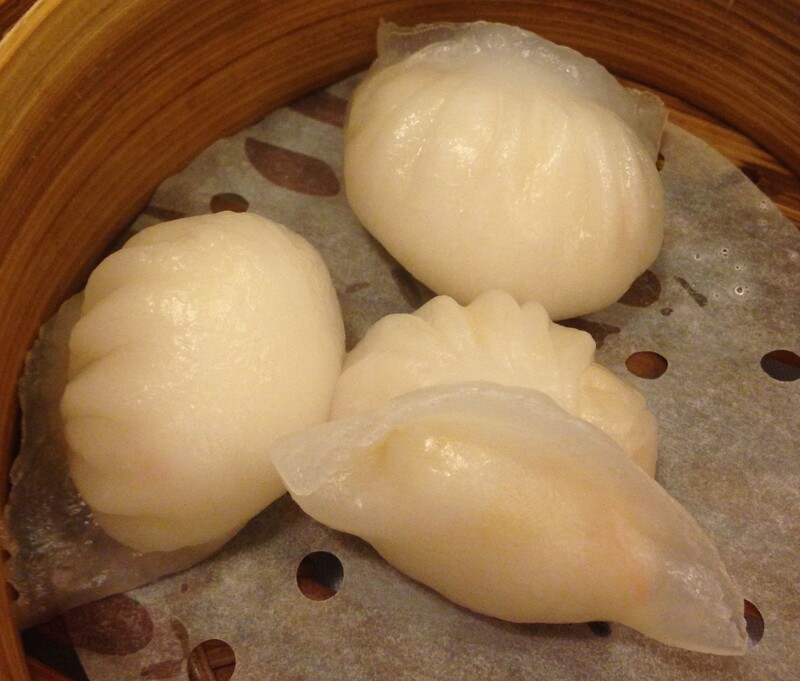 The char siu bao, har gow and lo mai gai are all delicious – quality and finesse in every bite. We finish with mango pudding and it is the most familiar to me for the trip with chunks of mango throughout the pudding and mango syrup on top. It’s an exciting way to finish the trip. Dim sum is something that grows on you quickly. The jasmine tea is a fantastic digestive and many of the dishes of choice are rather healthy. The main feature though, like many share situations, is the social interaction. Sharing food and tea is made so natural in this delicious format. What a fun ten months it has been writing this blog. Looking back I thought it would be good to think about my favourite experiences in Australia and overseas; at flagship fine diners and everyday venues. The ten months has taken me across to Perth several times, to the USA twice, Brazil, Hong Kong, and also up to Sydney. I’ve dined around Victoria in Daylesford, Kyneton, Geelong, Birregurra, Healesville and Emerald, and thoroughly blitzed through Richmond amongst many other Melbourne suburbs in this remarkable city. It goes to show that Gourmet Traveller is well named as a magazine; the two so intertwined. There are several themes. Kimchi popped up many times along with American barbeque, and Andrew McConnell seems to dominate from a chef/owner perspective. The other theme which has come across to a few friends and colleagues is that I am not a hard marker. I like food and I try to choose places I’ll enjoy or that I’ve been recommended. As a result I am probably not going to be providing my readers with the big “scoop” but hopefully my direction is found to be accurate. It is extremely difficult to choose my favourites from the past nine months so I’m taking a different angle. I’m going to list the restaurants that first come to mind (without looking at the list of restaurants I’ve been to) and for some categories choose one or two as the experience I most want again and/or one I couldn’t imagine not having had. 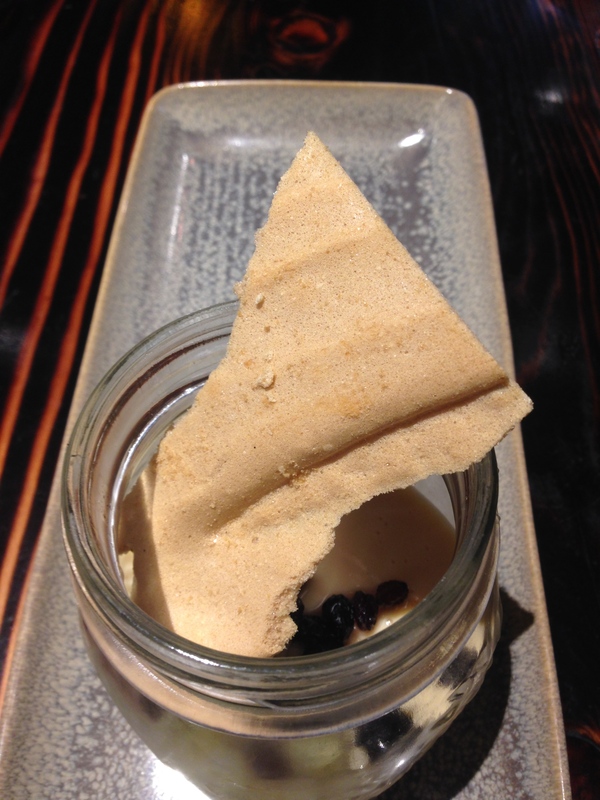 Australian fine diners – Momofuku Seiobo, Brae, Cutler & Co., Saint Crispin, Lakehouse. Brae again (please!) and Momofuku Seiobo as a treasured memory. Overseas fine diners – Chez Panisse (Bay Area, California), Eleven Madison Park (New York), Oleana (Boston), Lung King Heen (Hong Kong). Eleven Madison Park again (and again!) and Chez Panisse as a treasured memory. Australian casual dining – Supernormal, Luxembourg, Tonka, Supermaxi, Lalla Rookh, Pastuso. Too hard to choose just one! 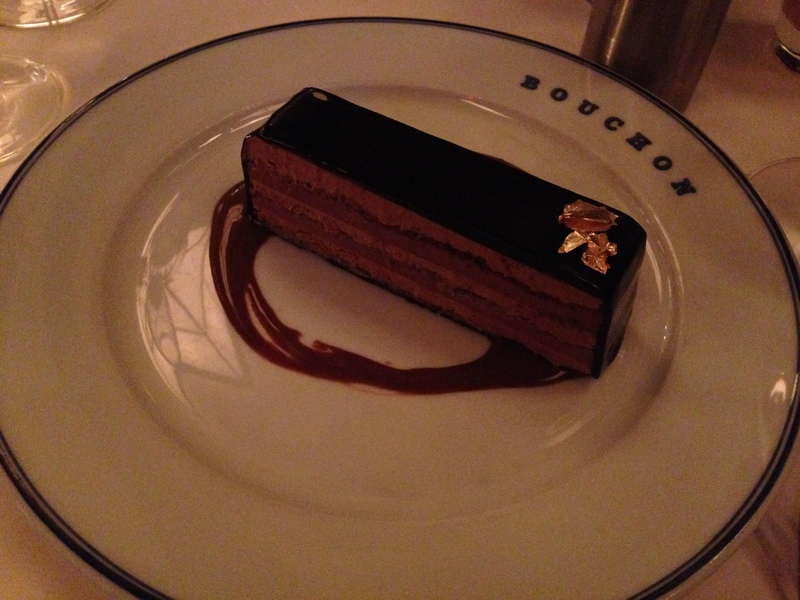 Overseas casual dining – Saxon + Parole (New York), Union Square Cafe (New York), Bouchon (Las Vegas). Saxon + Parole again but all are amazing. Australian cafe or cheap and cheerful – there are so many but General Food Store, Low Key Chow House, Kong BBQ, and Crabapple Kitchen spring to mind along with old favourites like Pope Joan. It really is too hard to decide on one, but to see the kimchi epidemic in full swing try Kong BBQ or Low Key Chow House (Perth). It’s been an incredible first ten months on this blog. Thanks to anyone who takes an interest in reading my reviews, and to those who I’ve shared these meals with along the way! There is no definition of what makes a restaurant a destination in itself. Though the Michelin Guide equates the greatest restaurants to “exceptional cuisine, worth a special journey”. There are times in the best meals where I lose the words to describe what I’m tasting, and feeling. Could this happen in Hong Kong and could it happen in a Cantonese restaurant? I would like to say that I’m worldly and know by heart the best restaurants across the globe. After New York I know a handful in destinations like Paris, San Sebastian and London, and after that just the top couple in a few places in the US and Europe. I had never heard of Lung King Keen even though friends had been there, but I knew they had been to a three Michelin star restaurant in Hong Kong. Hence the importance of Michelin’s guides, and the World’s Best Restaurant awards, but inherently difficult ability to discover the greatest for yourself. It seems that is only maybe possible in your home town. I know from this experience that there are differences in what is considered exceptional in Hong Kong, to what is exceptional in the other dining destinations I’ve mentioned. It is refreshing that this is the case. We are not in France, so it is pleasing to find Michelin are not judging in comparison to French restaurants. With such different cuisine what would be the point of direct comparison? After all, a lot of the food in China is based on recipes that have evolved over a longer period than many French classics. On to Lung King Heen and the welcome is warm and friendly, though without any air of importance and pomp. The room is loud in a colour sense; artistic almost; though projecting more about the decadent Four Seasons hotel the restaurant is housed in, rather than providing an entree into an exquisite Chinese meal. I guess in most senses it is like no other Chinese restaurant I’ve been to in almost every single way. The service was nice, not that noticeable (in a good way), attentive enough, experienced enough, but of the several floorstaff I cannot remember a flash of charisma. The reason I mention all of this to begin with is to put it aside, because in my mind, I came for the cuisine, and the cuisine is what stands out in my memory like the slow motion finish of a race. 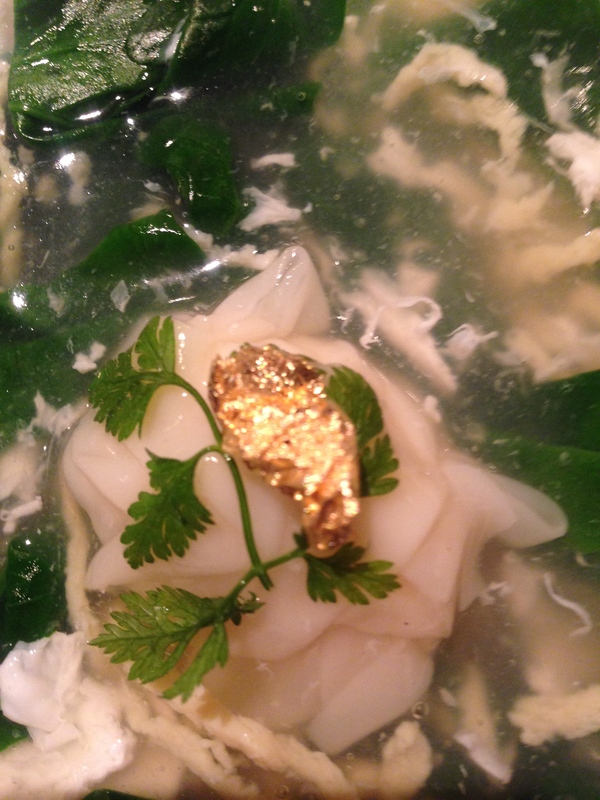 My favourite dish on the Chef’s Tasting Menu (HK$1,750) was refreshed several times, which is the sign of a great meal. In theatrical terms, there were many highlights in the script of this Oscar nominated movie, leading to a fascinating climax, and a short, reasonably satisfying ending. 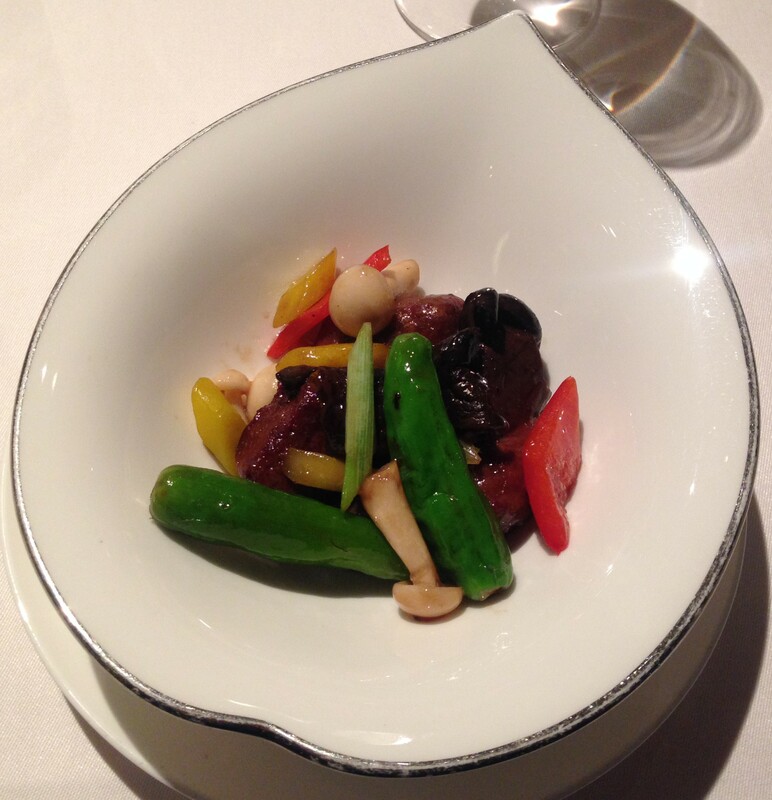 The climax was the “wok-fried superior Australian wagyu beef cubes with sarcodon aspratus and capsicum”. Now, I do realise that I just mentioned my favourite dish contained Australian wagyu beef, but this is absolutely in no way a patriotic or emotionally subjective inkling. Actually, the star of this dish was difficult to distinguish between amazingly flavoursome, complicated mushrooms (sarcodon aspratus), and beef that you eat in wonder at how it hasn’t melted into the bowl. There is technique used here that only the chefs and more experienced Cantonese diners could describe, but the end result is astonishing. 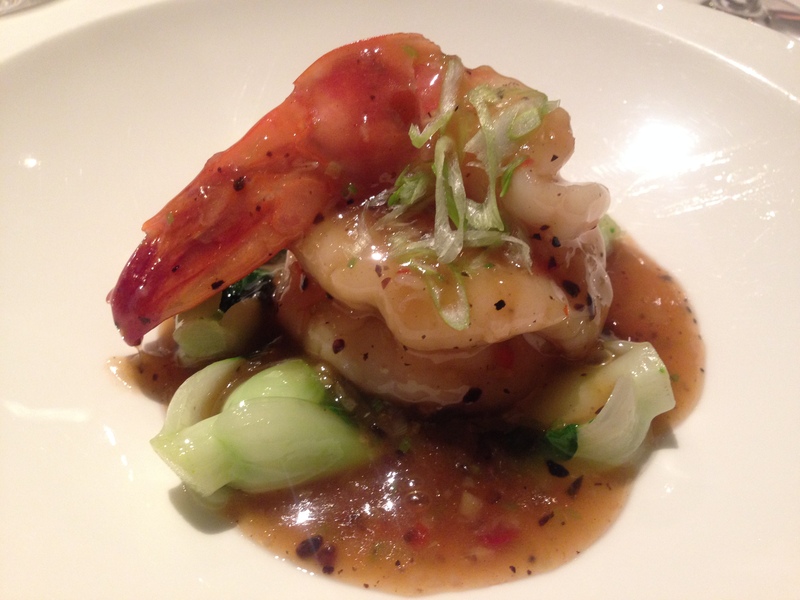 The next most amazing scene was the simmered king prawn in fermented black bean sauce. Besides the staggering size of the prawn, and the perfection in its just touched cooking, the delicate black bean sauce was a genius combination with what is, in the end, a sweet and subtle seafood. 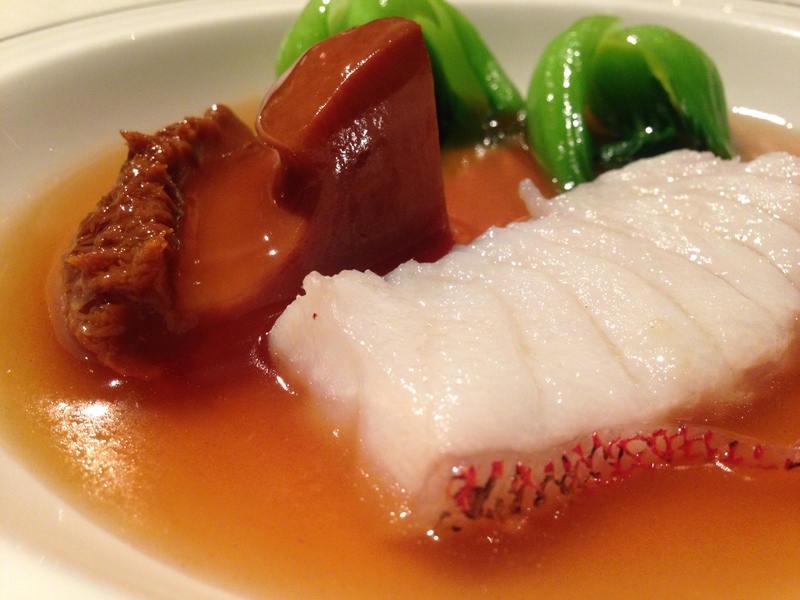 Keeping the gripping plot going was always going to be difficult, but the braised abalone cube with star garoupa fillet in supreme oyster sauce, amplified the light touch, but tightrope balance of executive chef Chan Yan Tak. It was fascinating that the abalone alone was very nice, and similarly the star garoupa on its own, but in combination they were outstanding. There was quite a diverse reaction to the second course of braised vegetable soup with lobster wanton and shredded chicken. The soup was glutinous and flavoursome. The star, lobster wanton, was amazing, but all too short lived. My preference would have been to have a single large spoon of the wanton with the broth for one divine mouthful. Prior to that we had the combination of appetisers that used that same suggestion. One divine mouthful of roast goose with plum sauce, another of crispy sucking pork, and another of barbecued pork with honey. All amazing, but showing that if you copy classics you can only elevate them so far, but if you create new dishes like the others on this menu, you can really make an outstanding statement. However, the dessert went a little too far for my tastes, and the rest of the table. This was the time where, after one outstanding dish after another, our minds turned to the sweet side of things. The ginger soup was delicious, but not sweet. In fact, with a little sweet potato in each bite, it was bordering savoury. The glutinous rice dumplings, in themselves, were fantastic. 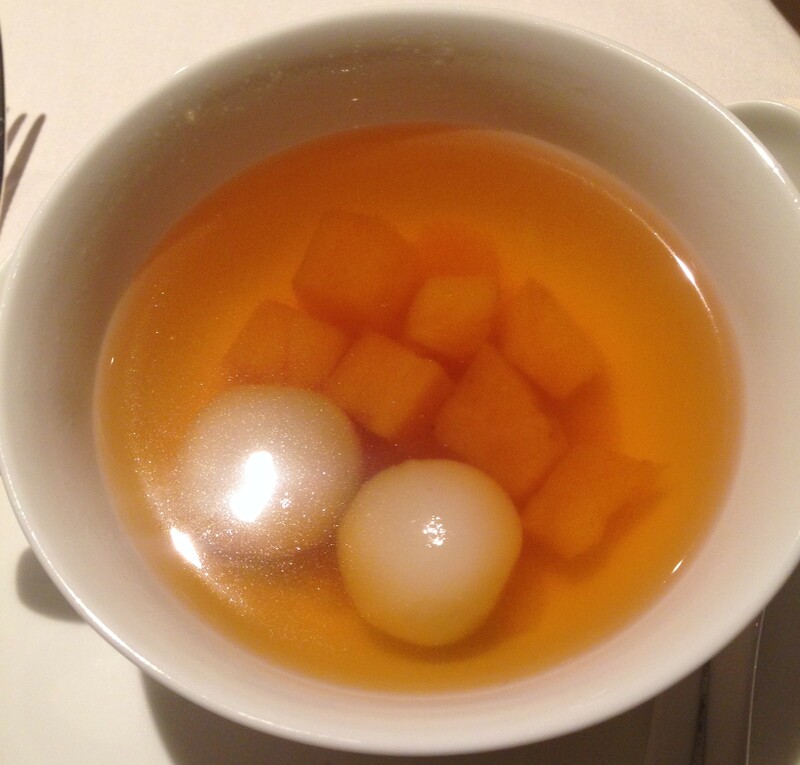 I know that Chinese desserts are often not overly sweet, and the rice dumplings were a good expression of this cultural fact. Though, like the wanton, were not numerous enough to actually make an impactful statement on the dish. 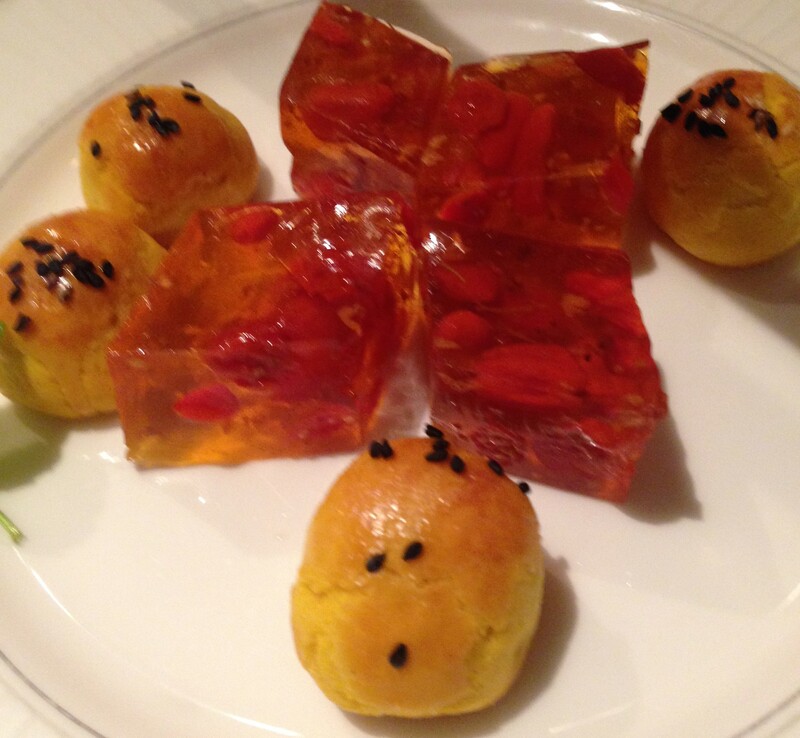 The Chinese petit fours with the chrysanthemum flowers and wolfberries in jelly are a classical dessert and were a nice way to end. I can see how Lung King Heen has been awarded so many accolades. It is the most creative Chinese cooking I’ve tried, and there were several incredible dishes, without any misses, albeit the dessert was not to my taste. Recounting on this experience, and having reflected more on it than most, leads me to believe it is near impossible to objectively compare it to most others in the same type of quality. What I can say is that there is a lot to like about the Western fine dining impact on this restaurant, and there is a lot to like about the flavours, combination and balance of the dishes I tried. 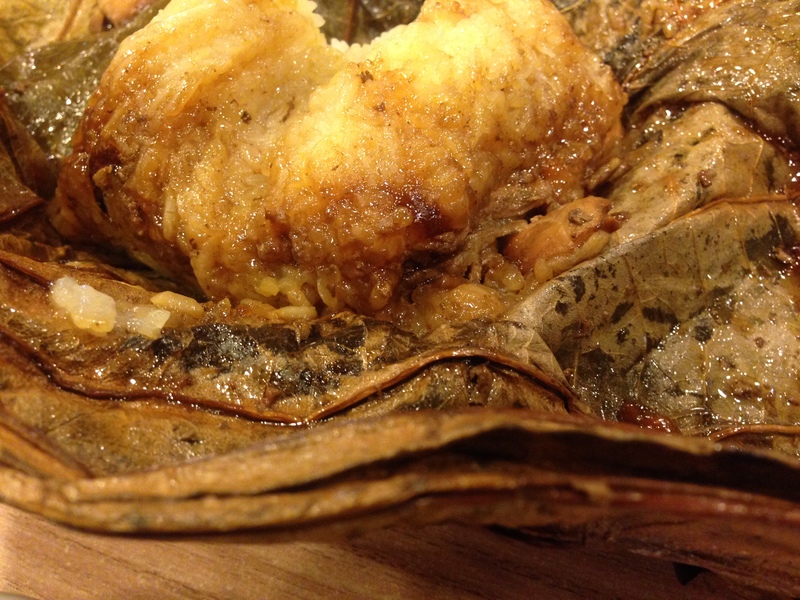 The ingenuity is delicious and I hope chef Chan Yan-tak continues with it for many years to come. I know I am old(er) because I can remember Tropicana. The novelty of being accepted into a café while your shorts are still soaking wet and you are barefooted didn’t get tired at all. The roof top above entirely belonged to my uni mate’s share apartment. Once I got to a new year’s eve party late and it was so packed my mate had long gone to seek a quieter less stressful entry into the new year elsewhere! Before I left Perth, I was already one of Il Lido’s biggest fans. Ever since, I have continued to come back again and again for breakfast, lunch and dinner. It has a feeling left over from Tropicana days, a style and vibe that was learned by the owners at Balthazar and Duende (amongst other great venues), and serves authentic Italian food in a casual communal environment. Every time I come back it is an incremental addition to my opinion of the restaurant and I am biased by the previous occasions where food, wine, company, atmosphere and service have combined to account for an excellent experience. This time is not different – I have many times been here by myself for a quickish dinner – but something feels different. It is interesting to think how the ambience at a restaurant can be so impacted by its exact location and therefore its predecessors. There are many examples I can think of that you almost know the next place is going to fail (or succeed). It’s unfortunate, but as restaurant goers we are a fickle bunch, and if you keep the same fitout it is likely we’ll find it hard to forget. On the other hand, with a little bit of effort, and something to differentiate, it is possible for the “bad corner” or “awkward part of the street” to break out of its location. From day one, Il Lido benefited from the good vibes of its predecessor and now it benefits from many years of significant patronage. There are a lot of kids serving, from the quasi maître’d through to the bar staff. However, unlike many restaurants in Perth, where uni students dominate, the training here must be good. Not only are they full of energy and enthusiasm, they know what they are doing, and serve well. Personally, the only issue I find in even the best service by less experienced staff is the fact they themselves may not have been out to restaurants often, and rarely know how to assist with aspects such as the drinks list. The make-up and strength of the wine list becomes very important, and Il Lido’s is pretty good, and pretty reasonably priced too. I am here alone, looking for a quick, good quality meal and I know what I want. 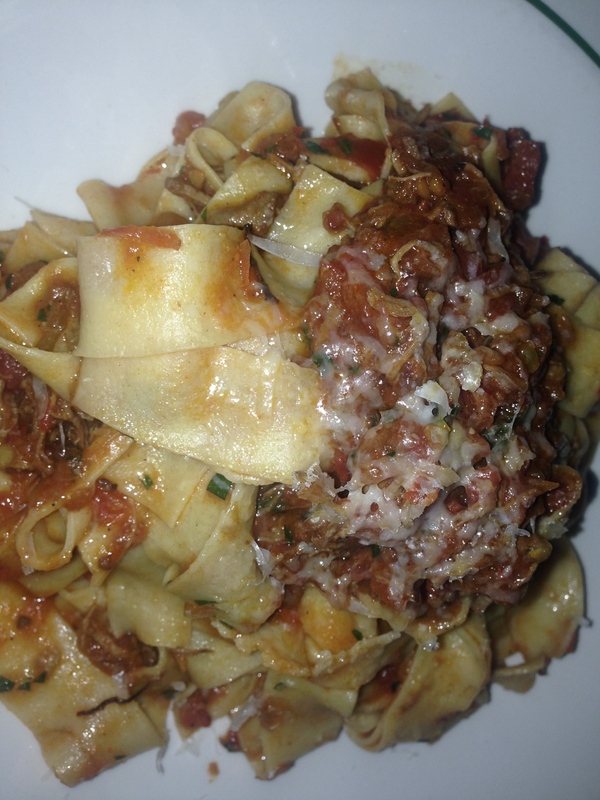 I order the tagliatelle with pork and veal ragu. It doesn’t look great in the photo with the unusually dark and intimate low lighting juxtaposed with the communal dining element, but it tastes delicious. It has been similar for years with excellent depth of flavour from the slow cooking and beautifully formed pasta. The glass of 2009 Zanato Valpolicella combined nicely too. Instant happiness. While it is a quick meal, I need to try the chocolate tart with hazelnut ice cream. It is a huge serving and would have been better to share. The tart is rich like you expect, and the pastry is well executed, but it misses a little on flavour for some reason. It could be the cacao which is very thick on the surface, providing a little too much bitterness and a furry mouthfeel. The hazelnut ice cream is nice, but again is not towards the top of the best hazelnut ice creams I’ve tried recently, which is a classic Italian flavour. Something I would not have noted, but it became abundantly clear during dessert, was the lack of thought in cutlery choices. For the pasta I got a knife and fork when I really needed a fork, and could have used a spoon. For the tart and ice cream I only got a spoon, but the pastry was firm and difficult to sever with the spoon, and the tart didn’t easily scoop with the spoon and ice cream. This is a small critique but if I was with others I would have felt a bit weird constantly needing to use my left hand with the dessert which was served on a plate (not a bowl – so no help at all). It is worth thinking about the comfort of the diner in these situations. Maybe it is another flag of inexperienced waitstaff too. I’ll never stop going back to Il Lido during all times of the day and with a broad group of people. It is a terrifically put together restaurant with many positives and only a few flaws. Bread In Common is educated by its older sibling and shows many of the benefits, but the original is still better in my opinion. 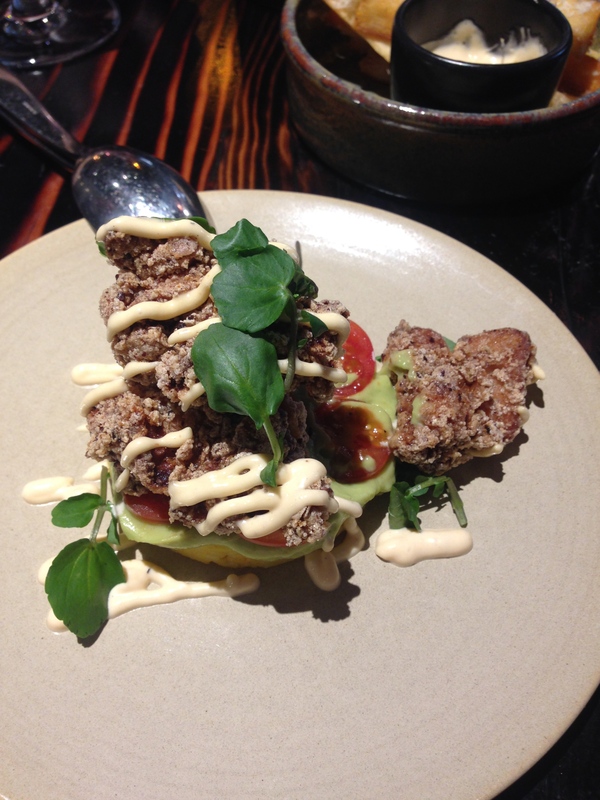 South American cuisine became a little hotter with the opening of Pastuso. Whilst there has been a steady emergence of restaurants honouring South American cooking for some years, it is by no means the strong theme of recent times. San Telmo has been my main education on Argentinian grill; I’ve travelled to Brazil earlier this year for the World Cup and experienced some of what South America has to offer in Salvador; but I haven’t been to a Peruvian restaurant so this is a first, and my only anchor on flavour is my experience today which has nothing to do with expectation or prior experience. Yet, sitting here in this very cool looking restaurant, I don’t feel out of my comfort zone. Many will with offerings such as alpaca meat, beef heart and a ceviche bar, which would put fear into some, and excite just as many! At night, the name of the restaurant is brightly lit and can be seen down ACDC Lane from Flinders Lane, which has to be the hottest street for restaurants in Australia, if not the world. Something draws you in to this wide fronted, airy and modern restaurant, that has a particularly long bar to the left and an open kitchen along the length of the back. It is extremely well thought through with private intimate spaces, interspersed with many tables where you don’t know which direction to look given the natural movements in the bar, kitchen, on the floor and in the entry. I’m with a couple of mates and with a focus on catching up we put ourselves in the hands of the chefs with a several course tasting menu for the very reasonable price of $59. To begin we are presented with two ceviches. One seems quite familiar, albeit flavoured with aji amarillo sauce and rococo jelly; and one is quite unfamiliar even though it has snapper as the protein. It is at this stage that the glossary on the menu starts becoming handy. The swordfish loin has a surprisingly delicate texture, but the strength to defend against the aji amarillo which is a yellow Peruvian chilli pepper and rococo which is a spicy red pepper. So really swordfish with some cucumber and some mild and hot spice. Makes sense right? The snapper on the other hand is flavoursome at first, but the leche de tigre traditional Peruvian marinade of citrus, chillies, coriander, garlic, scallops and fish, is really, really tart. I recommend it for a taste or two because the fish was amazing. However, probably best to stop there and go on to the next dish because it is full-on. The next taste was the low point of our meal. The “el choro chalaco” black mussel served on a seaweed crisp, just did not appeal. It is not a textural issue for me because I love mussels, but the combination lacked any punch or flavour. Instantly the mistaken mussel was rectified with oomph and heart. The “anticuchos” are beef heart skewers with sliced potatoes, grilled corn, huacatay (Peruvian black mint) and amarillo sauce. To say they were delicious is an understatement and there were almost battles for the fourth skewer. The “yucas” cassava (Amazonian root vegetable) chips are fantastic too. The pendulum had swung. While the chicken was indeed marinated, it was also fried, making the next dish quite indulgent. The Peruvian yellow potato, avocado and cherry tomato base combined beautifully with the chicken and the aji mirasol (sun dried yellow chillies) brought it all together. 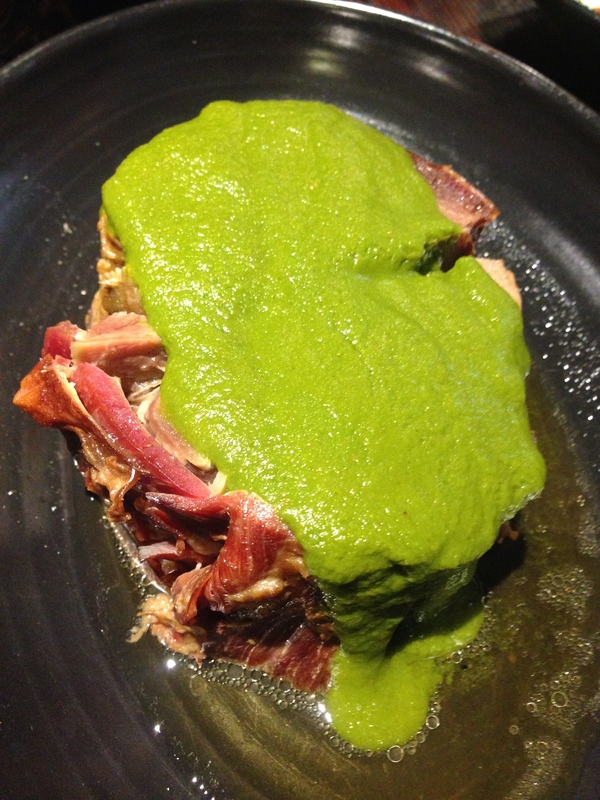 To finish the savoury courses we were brought “pierna de cordero”. The slow cooked lamb covered with seco sauce (coriander and beer sauce) is decadent. The lamb we were served fell apart like a dream and the taste was just that. The Peruvian rice served with the lamb is great too but the lamb just stole the entire show. It was at this stage that we were all getting pretty full and satisfied and dessert was still to come. The staff are fairly well drilled here on the dishes but some need to speak more clearly when explaining them because of the lack of familiarity of most diners to this cuisine. Service on the whole was fair to good in a semi-busy Friday lunch period. It was lucky that the teething problems in the fitout (a leaking water pipe one table away from where we were initially seated) did not affect us besides moving tables. Overall, there is a lot to like here, and many of the staff seem energised by being able to educate Melburnians about Peruvian food. On to dessert and it was really tasty but a bit of an odd dish to share between the three of us. The “suspiro a la limenas” creamy Peruvian caramel with port meringues was playful, tasty, but awkward as an ending. To begin, you crush the meringue and mix it through the caramel. The meringue achieves both an aesthetically pleasing presentation and a nice texture through the caramel. The caramel itself is rich and luxurious but I really would have liked one for myself! As I think about the Peruvian style food I shared with mates a week ago I find myself wanting to go back and try several other parts of the menu, including the alpaca. Forget some teething problems with the restaurant and the quite legitimate steep learning curve for the staff, there is plenty to like about Pastuso and it should be on everyone’s list for its diversity, uniqueness and intrigue.